It’s a time when, for just a few short weeks, we get to do things that we won’t do for another whole year. We can: drink eggnog, sing Christmas songs, bake special cookies, light Christmas candles, hang ornaments and give gifts to everyone in the family at the same time. Of course, you COULD do those things any time of the year if you wanted to. But having a special time of the year when you do certain things helps make those things memorable. I love eating crab legs, but I think if I had them several times a week every week of the year, I wouldn’t think they were so wonderful any more. Today I’m sharing our Christmas Activities Wish List with you. Some of these ideas are old family traditions, some are new traditions, and quite a few are ideas I’ve run across in the past few weeks while browsing other blogs and Pinterest. 1. Caroling- We’re going to go twice this season- once with my mom and a few other people, and the second time Steve and his parents will come along. Both times we’ll carol at nursing homes. 2. Dollar Store present shopping- Every year the kids make out a list of everyone in the family they want to buy a present for. Then we go to a dollar or discount store, and the kids buy presents for everyone on their list. When we come home they wrap their gifts and write labels. I’m thinking about changing this to going to a thrift store this year. 3. Rice Krispie Christmas Cottages – I like this alternative to the gingerbread house. 4. Lego Advent Calendar – I saw this idea in a blog last year, but it was already a week before Christmas at that point. I know Jared would like a Star Wars Calendar, but I’m debating whether it’s worth the extra money. 5. Christmas Chain – This is just like the chain we created for Halloween. We cut out strips from construction paper and tape them together into interlocking chains. Then each day we cut a chain off until it’s Christmas Day! 10. Write a book for my nephew using Illustory Make Your Own Story Kit. I am so excited to make this with the kids! We’re going to write an 12 page, double sided printing, hardcover book for my sister’s year and a half old son. The kids get to make up the story and illustrate the pages. Then we will get back the final, hard-covered book in the mail. White Chocolate Cherry Chunkies – These are awesome! We’ve been bringing them over to family Christmas parties for the past three years now. We always get requests. 15. Visit the Museum of Science and Industry for Christmas around the World. 16. Go on a drive to look at Christmas lights. 17. Light a Candle each night the 12 days before Christmas. The candles are placed along the outline of a Star of David which is carved into a wooden board. On Christmas Day we light all 12 candles and the entire star is lit. 22. Make a Memories Christmas Ornament – I just loved this idea! You get a cheap ball ornament and with a permanent marker write down memories from the past year. I wish I would have started this the year the kids were born. I think we might even make one for each set of grandparents of memories we shared with them throughout this year. What are some of your Christmas or other holiday activities you’re looking forward to? Love the idea of Borax Snowflakes – this might end up on our own wishlist. I am very excited this year about taking my 6 year old to see Nutcracker presented by Moscow Ballet. I hope your trip to the Nutcracker was fun. The Moscow Ballet- sounds like it must have been beautiful! We went to see a Nutcracker ballet last year, but this year we decided to see a production of a Christmas Carol instead. We have so many options where I live, it can be a little overwhelming! So many great ideas here! I’ve made a note of many of them…thanks I saw a version of the rice crispy treat houses last year, but I had forgotten about that. I want to make some borax crystals again this year…they turn out so well! We wound up not making the borax crystals and quite a few things on this list:( I think we had too many things outside the house planned. I really wish we had more days where we just stayed home and did fun projects-something I will definitely remember for next year. And I have to remind myself that there will always be another Christmas season to do things,too. Yes, there will be another Christmas season. 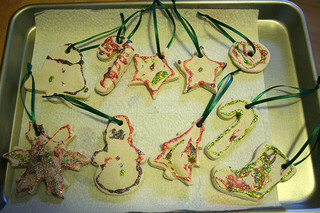 We tried making the borax crystal snowflakes and they just didn’t turn out for us this time It was a disappointment! I love these! I never thought of the ornament idea. That could be very cool during the girls teenage years! I am going to definitely do this. Last year we studied Handel but we were too late to attend a concert. I really need to get on the ball and find a local production…….thanks for the reminder! I’m so glad you found it helpful! We wound up making both grandmothers an ornament of all our memories with them this past year. It was so awesome seeing their happy tears! Oh gosh, thanks for all the ideas! Some of these we have done, others not yet. Your links are great – so much information in one spot. I shared this over on The Hmmmschooling Mom facebook page.